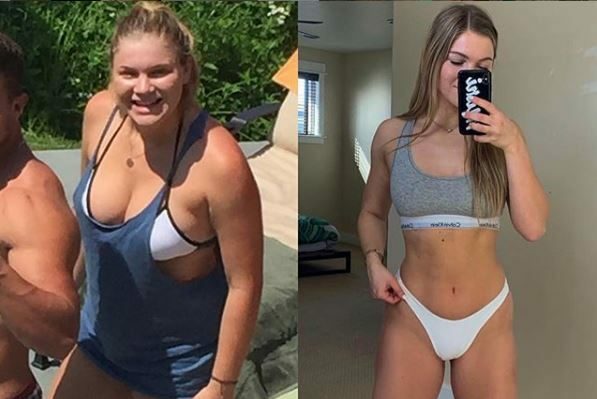 Home » Lifestyle » 19 Female Body Transformations That Prove This Works. Incredible. For women looking to achieve a complete body transformation, knowing where to start in the gym can be a challenge. Your food may be perfect, but should you be hitting cardio for hours on end? The answer is pretty simple girl, no. Lifting weights is one of the best ways to boost your metabolism, burn fat and tone up. So many women think it can make you bulky and masculine. Well we’re here to prove you wrong. 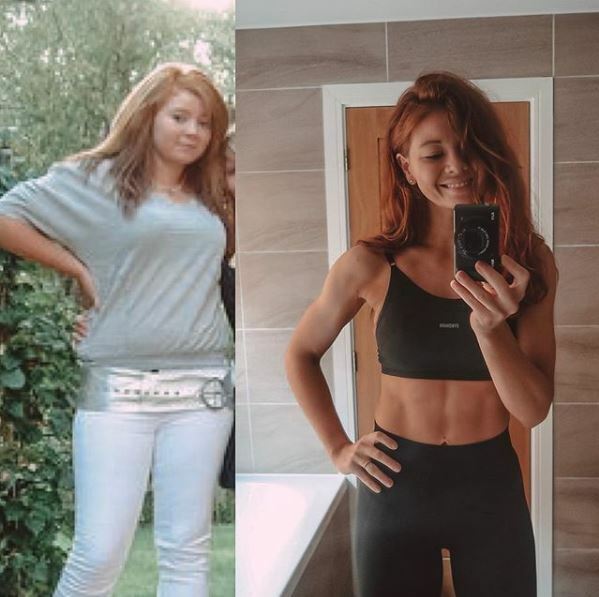 We’ve collected 19 body transformation pics from some truly inspiring women, who’ve used weightlifting to change their physiques and their lives. Whether you’re in need of some inspiration to get you to the gym, or are curious about how weightlifting can change your lifestyle, we’ve got you covered with some truly incredible body transformations. Here we have the incredible Stacey D. After starting out with CrossFit on the left, she changed her focus over to powerlifting and watching her macros. This lead to a pretty incredible transformation that saw her tone up and drop 5 percent bodyfat. It wasn’t a quick transformation though. This kind of change takes time, dedication and some serious grit. 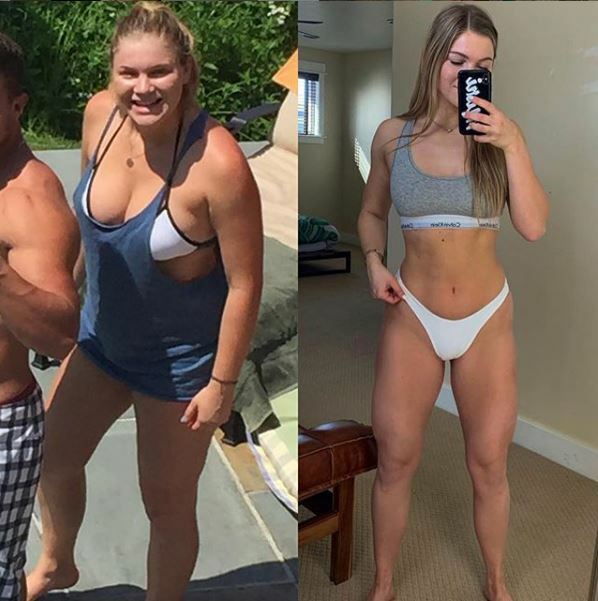 Abby puts this incredible transformation down to lifting heavy, using compound movements and adjusting her diet to suit her training. After struggling with an eating, she said it was committing to a weightlifting program that helped her change her life. 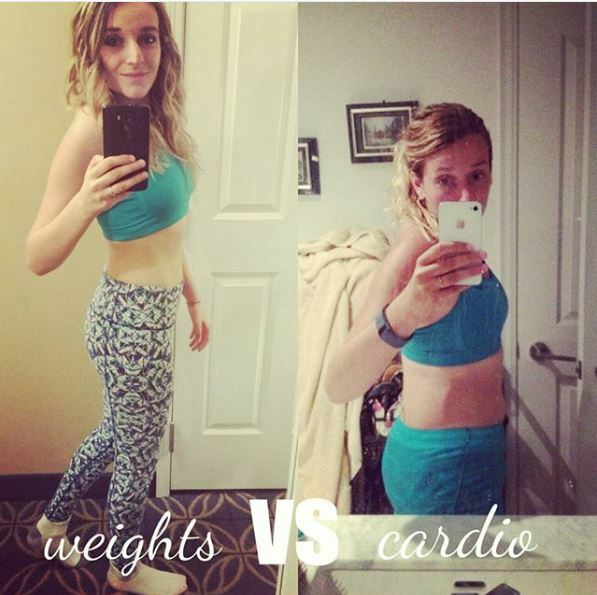 After drilling cardio, Jessica wasn’t seeing the results she was hoping for. Instead, she turned to lifting weights and claims that’s where she’s seen the very best progress in her physique. We think she looks amazing for it. Samantha advocates clean eating and weight lifting when it comes to her transformation. She’s lost fat and toned up and puts it all down to training with weights over cardio. With just nine months between these two pictures, Daniella puts this incredible change down to a switch from cardio to weightlifting. 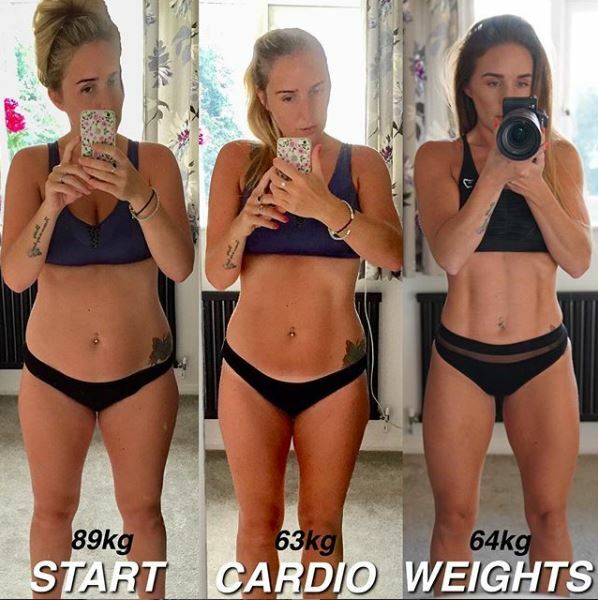 She said, after losing a stone, she thought cardio, HIIT and walking was the way to keep the weight off. However, after a little research, she discovered weightlifting was a much better way to stay in control of fat levels and tone up. 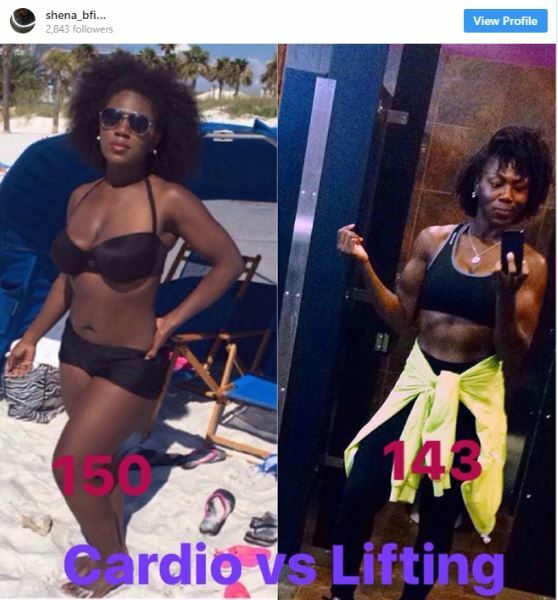 On the left, Shena said she was doing way too much cardio, never lifted weights and wasn’t eating enough protein. After changing her training and eating habits, she saw the transformation she was looking for all along. Shena puts a very strong emphasis on ensuring you get the right nutrition to build muscle and maintain your exercise habits. Here Kim highlights the incredible difference a change of mindset can be. 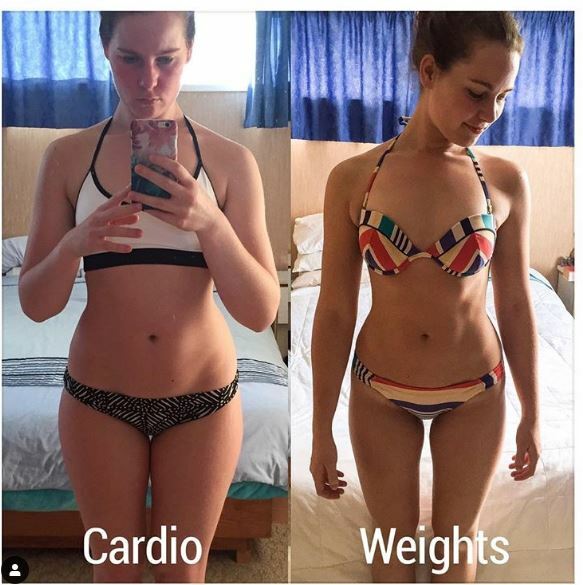 By focusing on weightlifting and cutting back on cardio, she’s completely transformed her body. While she saw some success by hitting the running machine, her greatest progress came when she ditched the treadmill and started lifting heavy things. Her favorite thing about weight training is the shape she can see in her body. 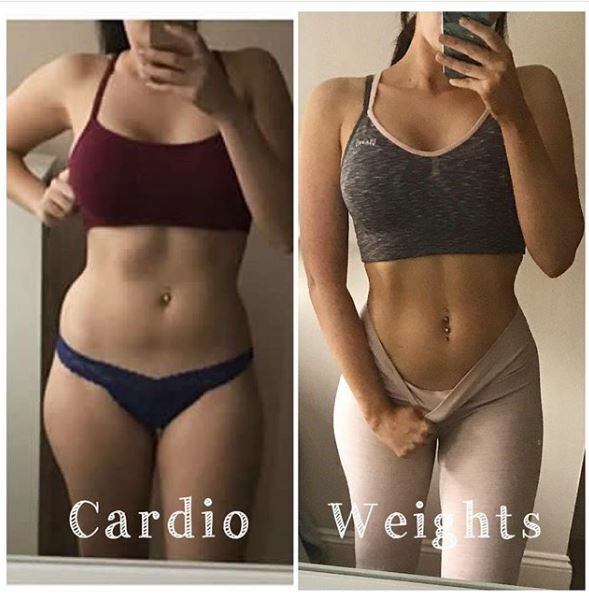 This fitness queen says she’d spend hours at the gym doing cardio after cardio after cardio workouts, trying to achieve that toned instafit look. She was almost discouraged when her progress never really took off. After changing her approach, opting for weight training and taking a more sustainable stance on nutrition, she’s transformed her body. In this transformation pic, Erin Beth says she was undereating, was too self critical and didn’t feel good in her own skin. She says her transformation took place when she started to embrace her curves, love eating guilt-free again and making her body as strong and healthy as she can. Now she’s the self-described pizza queen of the fitness world. 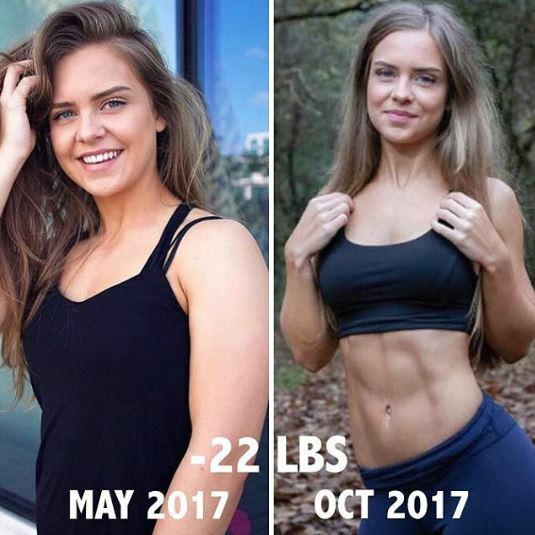 Body transformations aren’t always about eating less, Emma says her biggest change here is how much healthier and happier she feels. 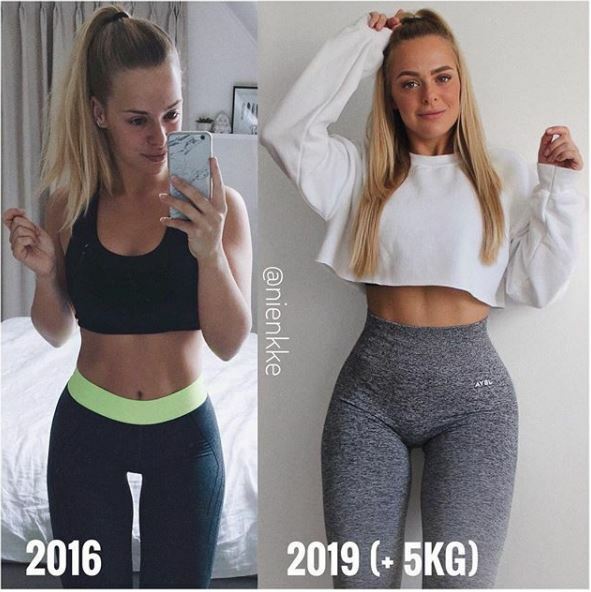 On the left she was obsessed with feeling and looking skinny, and despite the fact she was very slender, she felt unsatisfied because she didn’t yet have abs. After falling in love with weightlifting, she now eats more, is approximately a stone heavier and feels stronger and happier. Body transformations happen when you least expect and for Mari, she said hers began after she hit rock bottom. At this point she chose to push herself harder than she ever had before. She began lifting weights, eating a nutritious, healthy diet and aiming to better herself every day. Here, Nienke fights the idea that losing weight is what every girl is looking for. By weightlifting and getting the right nutrition into her body, she’s transformed her shape and now lives a healthier, happier lifestyle. 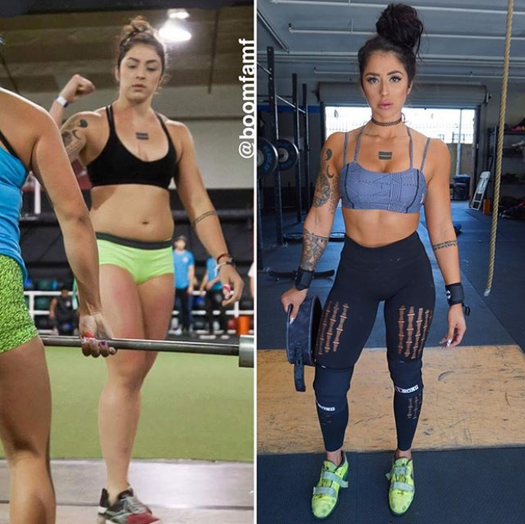 Switching from cardio to weightlifting was the driving force behind her incredible transformation. On the left, Elle said she was eating badly and struggled to achieve a good balance of nutritious food and exercise. Since turning to weightlifting and eating more intuitively, she’s completely transformed both her health and her body. By cleaning up her eating and hitting the weights room, Angela has achieved a truly spectacular transformation. Now she’s all about living a fulfilling, healthy lifestyle and bettering herself and her body. After suffering from eating disorders, Chiara found weightlifting and soon fell in love with the results. She never misses a legs day and uses training as a form of therapy. 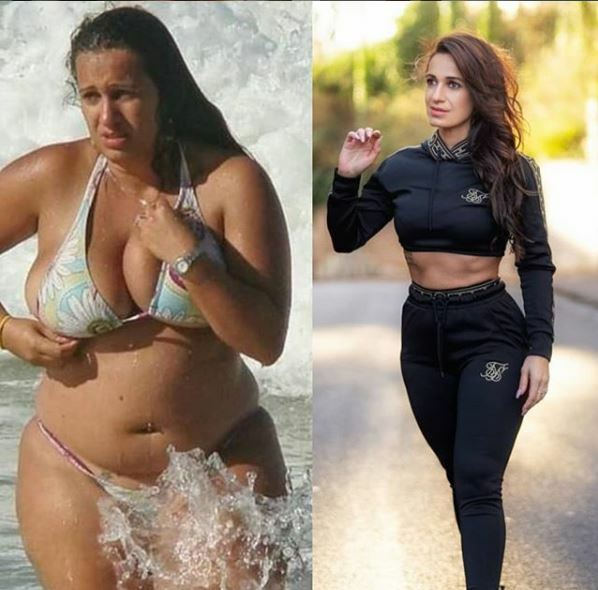 Chiara never pretends these body transformations take place quickly, and often talks about the work she had to put in to achieve this gorgeous phsyique. Here we have another girl who’s swapped trying to be skinny for strength. Emily emphasizes how much focussing on being healthy and strong has changed her perspective on her body and on exercising as a whole. This is one of our favorite fitspo girls. 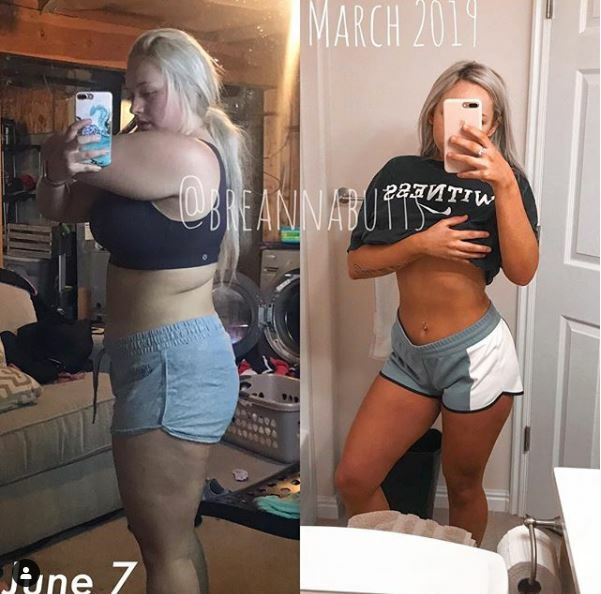 She’s turned to the ketogenic diet, along with a weightlifting routine to shift unwanted pounds and now Breanna is healthier and happier with the way she looks. Doing this has helped her find a balance between exercise, food and enjoying all the whole process. Although she weighs the same in these pictures, a whole lot has changed in nine years for Cristina. Now she uses weight lifting and clean eating to keep her body healthy and her mind happy. Cristina is also a huge advocate of progress pics over measurements and numbers on the scale, saying their a much better measure of how far you’ve come. This transformation comes by way of smart eating and lifting weights. Sophie puts her success down to hitting the gym regularly and sticking to a challenging workout routine. So many women are now turning to weight lifting and recording incredible body transformations along the way. If you’re feeling inspired, you may be on the lookout for a weights-based workout programme that can transform your physique. Check out our review of the BOSS Workouts Shape and Burn program to find out if it’s worth your time. So did these women do it by just lifting or also using these produces ???? Ok of course I want the after body! But I’m not willing to live on celery and lettuce to get there but am willing to bust it out in the gym! Any hope for that possibility? 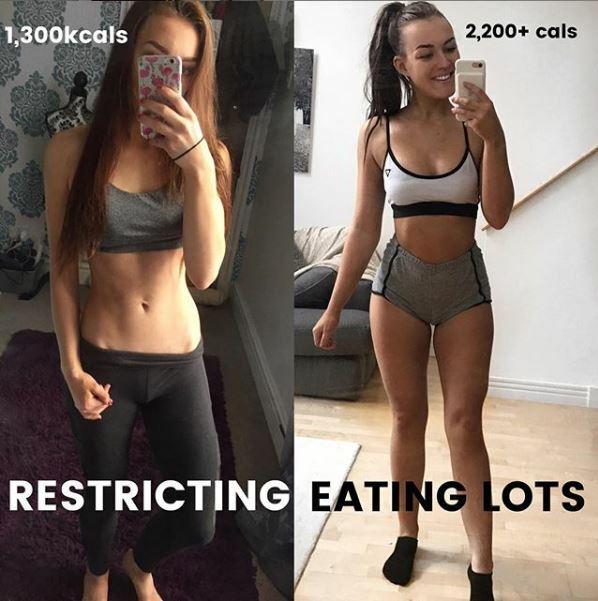 Lol those girls don’t live on celery and lettuce, they need a lot of protein to build muscle, they eat a lot more calories than a regular skinny fat girl. Celery and lettuce won’t give you the strength to even begin to do these exercises! Start with good, natural, unprocessed foods. You’d be amazed at how much you can eat and still lose a ton of weight. How did they get their skin back to shape? Normally large weight loss produces extra sagging skin. I wouldn’t want such a bit bum! This is so inspiring! Especially for somebody like me who’s just starting to get back into fitness again!